The last option is the best for fixing the boundary breach while also maintaining loving relationships. Noticing when a boundary is being stretched gives you the best chance to respond in a calm, respectful way. By speaking up immediately, you take responsibility for your own needs. You’ll have a better chance to respond respectfully before the boundary is broken and you’ve reached the “I can’t take it anymore” point. When you set a boundary, you are declaring a limit. Others may respect your boundary or they may test it. Kids test boundaries by begging, whining or simply doing what they know they are not supposed to do. When that happens how do you respond? Before acting, you may want to put a hand on your heart and take a few deep breaths. This breath break will help you center yourself. Feeling more grounded will allow you to act from your higher self. Situation: Your child is jumping on the couch even though you’ve told them not to. Establishing boundary: You lift your child off the couch and put them on the floor. You tell them they can jump as much as they want on the floor. Situation: Your family has been invited over for dinner at your aunt’s house. Although you appreciate the offer, your week has been crazy so you politely decline the invitation. Your aunt pleads with you to come arguing that you have to eat dinner anyway so you might as well come over. Situation: Your child wants to go over to a friend’s house. After asking a few questions you realize the friend’s parents are not home and so you tell your child no. Your child begs you to change your mind adding that other kids are going and their parents are letting them. Situation: You are waiting in line to get into an event at your kids’ school. Someone cuts in front of you. Maintaining your boundaries means having your own back. You respectfully stand up for yourself. By standing up for yourself, you teach people what you will and will not tolerate. Plan on stating your boundary many times using similar words. Other people will often push back and express their disappointment. Take another deep breath and restate your position. 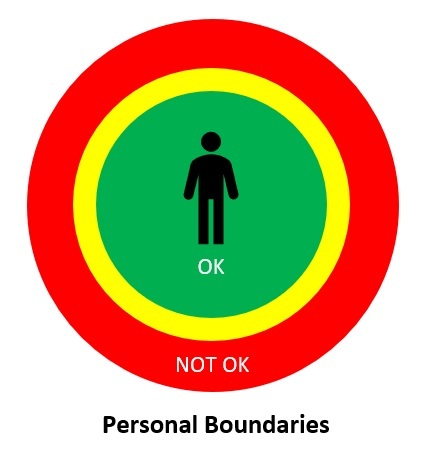 Setting and maintaining boundaries is a skill your kids will use for the rest of their lives. When you model maintaining healthy boundaries, your kids learn how to do this.